1. Set up CrowdTangle Lists for your sources' social media accounts across Facebook, Twitter and Instagram, so you never miss a post. Suggestions include lists for local businesses, hospitals, first responders, politicians, government agencies, colleges and universities, local sports teams etc. Pro tip: use our embed tool to optimize your stories with relevant posts. 2. Create Saved Searches around topics you’re covering to surface posts across Facebook, Twitter, Instagram and Reddit mentioning those keywords. Identify influencers posting about these topics by filtering your search by “verified accounts.” Pro tip: sync these searches to Digest and Viral Alert Notifications so you can receive updates in your email and/or Slack channels. 3. 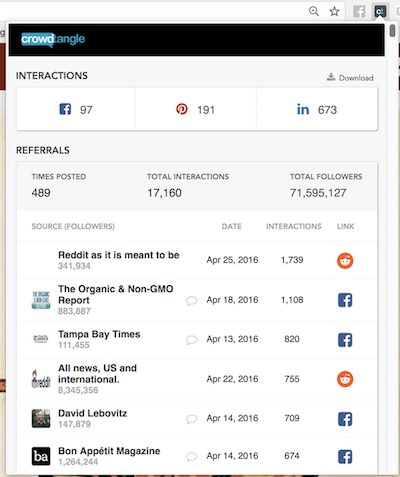 Use the CrowdTangle Chrome Extension to see where your stories are being distributed and the audiences your reaching across social. Visit the posts directly to view comments and answer any questions. 4. Analyze longer term social data on the account and post level that can be cited in reporting using CrowdTangle's Intelligence and Historical features. Ideas include, stories about the top posts for any account or stories comparing account data for influencers and important figures. 5. Search through Facebook Groups and Reddit threads to surface conversations and posts on social media about topics you cover.